This Private Tour to Mt. 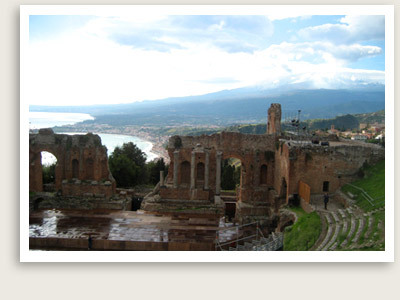 Etna and Taormina Include: private transportation with English speaking driver/guide, taxes, parking, toll, wine tasting with lunch, tasting pastries, entrance to Greek Theater in Taormina. Not Included: Entrance fees to sites not in the planned itinerary. 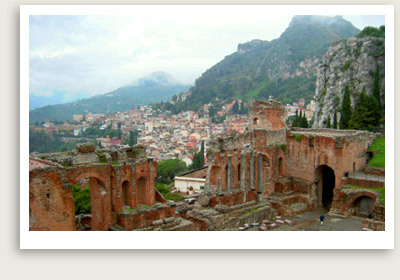 Various Departure Points: Messina, Catania, Taormina. Other Departure Points Available. Enjoy a private tour of the villages that thrive on the slopes of Mt. Etna, while sampling Sicilian products along the way. You will travel to different local villages of the Alcantara Valley, visit the Alcantara Gorges and a wonderful waterfall created from an old Etna lava flow 40 miles long. Your tour of Mt. Etna then takes you to the “red wine” route, literally traversing the lava flows of 1981 as you cross through the village of Linguaglossa and its cluster of Baroque churches. This area is known for its delicious almond pastries, and you will stop to sample some in a traditional pastry shop. You will also tour a fantastic winery, and sample this rare Etna wine, accompanied by a selection of local Sicilian products fitting for a nice lunch of antipasti with wine. On the way down, you will pass through a fragrant pine tree forest before arriving in Taormina. You’ll tour this beautiful town, situated on a rocky plateau of the steep Monte Tauro, which dominates the Ionian coast, with Etna rising majestically in the background. Downtown Taormina represents a variety of historical periods, from early Greek and Roman settlements, to Byzantine and Medieval remains, up to 15th-century Catalan buildings and 17th-century Baroque churches. You can stroll Taormina’s main street, Corso Umberto, with its art and designer shops, Baroque churches and Palazzos, and get a glimpse of the breathtaking Greek theatre facing the sea. Your guide will make suggestions where you can have an excellent meal. Time permitting, you can end our tour with a visit to the charming village of Castelmola, a medieval hill town above Taormina with breathtaking views and narrow, picturesque streets.